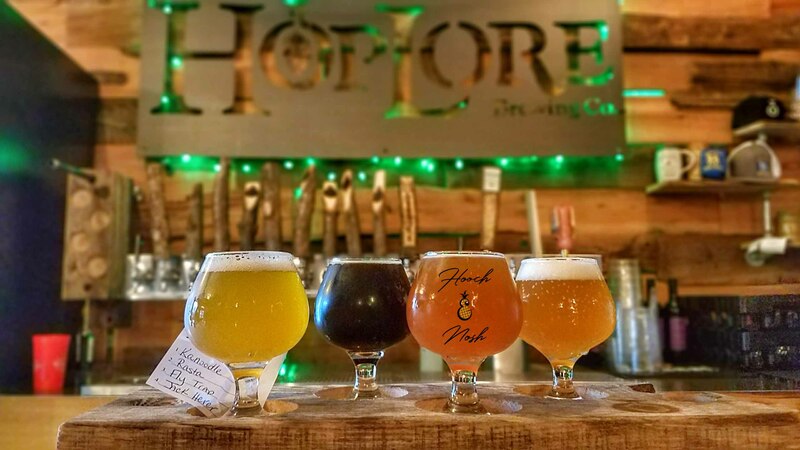 Lore’d of the Hops, a beer fest set to debut this weekend at HopLore Brewing in Leesburg, Indiana, (Saturday from 4-7 pm) promises to be a great experience for the beer lover in your life. Even if you aren’t a fan of beer, the event looks to be an excellent time to expand your palate as over 20 breweries and vendors with over 50 craft beers will be available at the event. Tickets for general admission are $30 and include an unlimited sampling of the beers at the fest. VIP tickets, which cost $65, include a one hour early entry, souvenir taster glass and VIP only beers. Designated driver tickets can also be purchased for $10. Tickets can be purchased here. Beer flight at HopLore Brewing. I was able to sit down with Stefan King from HopLore to discuss the festival. His passion for the event and beer in general is evident in his responses. How did the idea for the event come about? “We are simply fans of beer! Being in the community we have always wondered why there had not been an event like this within a 40 minute drive of us here in K County. We were presented with an opportunity to work with Indy Craft Brew group to put this Brewfest on and decided to jump in feet first and make it happen. This gives people in our community that have simply been presented with the macros or mainstream craft brewers to see breweries that are more local and also are doing some really fun things with beer. Our concept from the outset of HopLore was to deliver products that changed the way people looked at beer. Beer in many ways in our time is very exploratory – new styles, new flavors, new methods. Names like Four Fathers Brewing (Valpo), Summit City Brewing (Fort Wayne), 450 North (Columbus), our other locals, Orthocity and Man Cave, and even a brewery from the Detroit area called Rochester Mills who specifically requested to be a part of this event, are doing great things. What does it say about the local brewing scene that this is the first event of its kind in the county? “The biggest thing I think it says is that the scene is growing faster than before. More people are becoming regular craft beer drinkers rather than just taking an exploratory dip into tasting new things. Beer is no longer something that is looked down upon comparative to wine. Restaurants are designing dishes to pair with beers the same way that they have done with wines for a long time. Bars are starting to see that local offerings are something that people not only want, but expect to see on their taplists. Breweries scheduled to appear are HopLore Brewing, 2Toms Brewing, Kekionga Cider Co, Ash & Elm Cider, Rochester Mills Beer Co, 450 North Brewing, Man Cave Brewing, Off Square Brewing, Four Father Brewing, Evil Czech Brewery, Bare Hands Brew, Central State Brewing, OrthoCity Brewery & Smokehouse, Plat 35, Craft Roads Beverage, Summit City Brewerks, 812 Farms, Fenwick Farms Brewing, Tinman Kokomo Brewing, Promise Coffee Roasters, Topling Goliath Brewing, Avery Brewing and Almanac Beer Co.
Music Guests include Robert Rolfe Feddersen and Tony Pebworth. For more information on Lore’d of the Hops, you can check out the event’s Facebook page.